We are a leading Manufacturer of Gravy Machine, Atta Kneading Machine, Vegitable Cutting Machine, Banana Wafer Machine, Chutney Machine and 2 In 1 Dry and Wet Grinder from Rajkot, India. 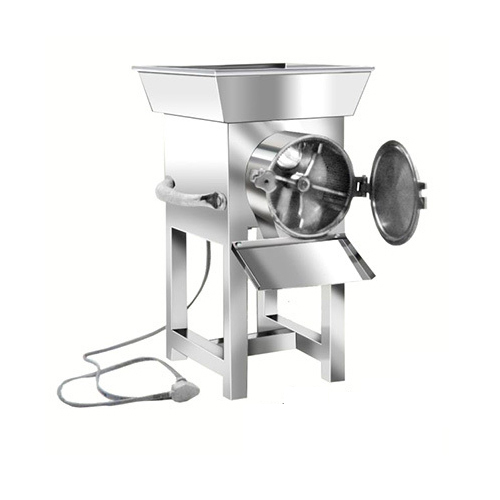 Gravy Machine stoneless wet grinder S. S Sieves and Heavy duty motor Low power consumption. Usage: To Make Punjabi Gravy, Pulp & Juice from all Green vegetables Like Tomato, Onion. Garlic, Palak, Green Peas, Beetroot, Karela etc. wet Dal crush for Idli Dose, Khaman, Dalawada, Juice From Green Avila (Amla) Pulp from Aleovera to make powder & Tukda of Ground Nut (Mungfali Dana) & Dy Fruits. Usage Cutting for Potato,Gourd,Brinjal,Cabbage etc. Note:- Available in 3 Cutters. Quality product with stainless steel blade & sieve to give long lasting performance Green masala mix, Chutney crushing, potato pulp for Dabeli, shdkhand mix & Non veg. Items. Available Size: 32/64 with and without motor. We are engaged in manufacturing a wide range of smart Vegetable Cutting Machine. These are used for cutting vegetables in slice, finger chips, jubilien cutting, shradding & cube of various sizes. Also, these machines enable in speedy cutting of potato, bitter gourd, brinjal, cabbage, radish, beetroot, cucumber. Machines we offer has the capacity to cut 100 kg to 500 kg of fruits & vegetables per hour, and into (1mm to 30 mm) pieces. Usage Making Farsan Ganthiya,Sev,Papdi Etc. We have available wide range of potato/vegetable peelers. Capacity per batch 5 kg. 10 kg. 15 kg. 20 kg. 50 kg. 100kg. and also customised continious models per hour 1000kg with grader. We are engaged in manufacturing a wide range of Almond (Badam), Pista, cashew, peanut powder making Machine. These are superior quality chips and powder making machines, made by aluminum, stinless steel for lasting performance. Machines offered by us are used for garnishing & decorate sweets. Shrikhand & ice cream. Available in 4 models with and without motor, these can be purchased at affordable prices only from us. We are involved in manufacturing an extensive range of 3 in one Kitchen Machine(Miller, Shredder, Grater). Manufactured using quality stainless steel , these are provided with multiple use round sieve. These are used for potato, gajjar, dudhi, beetroot, cucumber (kakadi), papaya, cabbage, coconut scrapper (powder) cashew (kaju) & dry nut powder, peanut (singdana ,mumfali), churma ladu preparations. Available with and without motor, these are also used for preparing dry nut tukada for ice cream shrikhand/ lassi/ milkshake. We are engaged in manufacturing a wide range of Peeling and washing Machine. These are superior quality machines, made by Stainless steel for lasting performance. Machines offered by us are used for Vagetable washing and peeling. Available in 4 models with and without motor, these can be purchased at affordable prices only from us.